In the HR world, one of the top goals is to hire “right” the first time. There really is nothing more important than finding people who complement your culture. So today, let’s focus on how poor hiring decisions affect an organization. When a company has an open position, there’s a lot of pressure to get it filled….and fast. On average, one study reported that filling a management position takes 7.5 weeks, while a staff-level position takes 5 weeks. As the old saying goes, “Time is money.” And since the hiring process can place an unbelievable burden on an organization, especially when there are no best practices in place, it’s tempting to check it off the list as quickly as possible. But haste often leads to bringing the wrong candidates aboard. And that’s when the multilayered honeymoon phase begins. Similar to an onion, as each peel falls away, you’ll begin to see whether you hired the right employee. This layer represents the acclimation period. There may be some friction as employees are getting used to the organization and culture, but by and large, you remain confident they will be a great fit for the position. Several weeks in, the employee should now be settling in. If they’re not, this could be the first sign of trouble. However, some employees simply need a longer onboarding time, so an extension of the acclimation period generally isn’t a deal-breaker. More time passes, and ideally, the employee is integrating nicely thanks to the additional time. If not, you may begin second-guessing yourself. Is the position the wrong fit for the employee? Or is the employee the wrong fit for the culture? Before transferring them to another position though, you first offer more training, coaching, and resources to the employee, thereby increasing your investment significantly. Again, weeks or months pass. Hopefully the additional training has turned things around for the new employee. If the employee is still struggling, you may decide to try them in another position (if possible) instead of terminating them. You make the move and allow them more time to acclimate. The already substantial investment rises. At this point, it’s really sink or swim. If the employee hasn’t made great strides, it’s apparent that the employee isn’t a great match for the company, regardless of position. Termination is likely the next logical step, and unfortunately, your considerable investment will be lost. As employees move through each layer of the honeymoon phase, the employer’s investment increases. The US Department of Labor estimates the potential loss in these situations is approximately 30 percent of the employee’s annual salary. And while it’s absolutely critical to invest in the success of your employees, there comes a point where further resources simply won’t undue a poor hiring decision. 11% of respondents reported fewer sales. 39% of hiring managers reported drops in productivity, in part because supervisors spent nearly one full day each week managing poorly-performing employees. 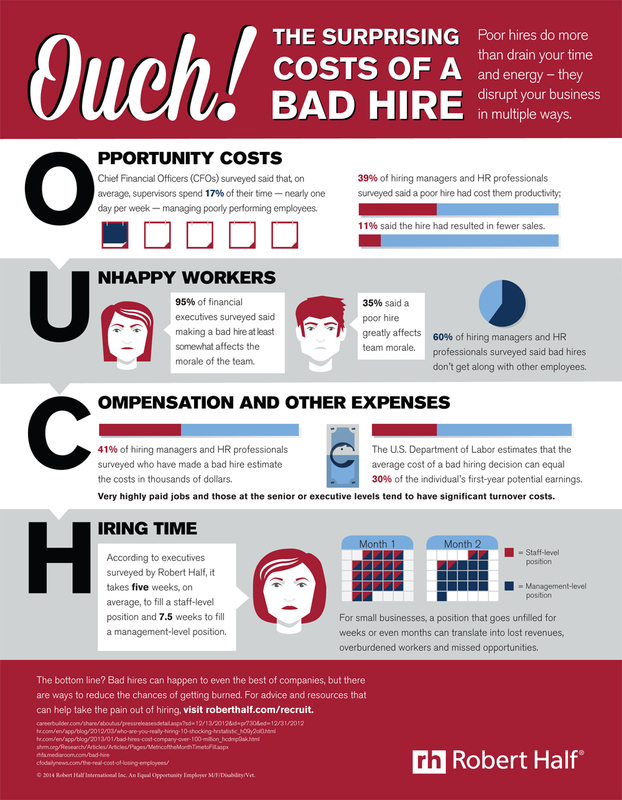 41% of respondents estimated the cost of a failed hire to be in the thousands of dollars. With those numbers, there’s certainly a lot at stake. All the more reason to establish best practices and hire “right” the first time. Good article. Staffers can often underestimate what it really costs to hire a worthwhile employee, but a bad employee is even more expensive.